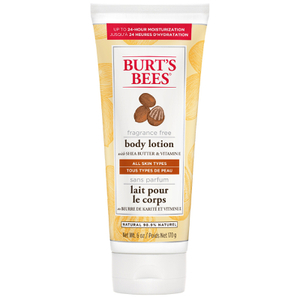 Perfectly pamper skin with the Burt's Bees Milk & Honey Body Lotion; a fast-absorbing, ultra-moisturising formula to replenish and rejuvenate from top to toe. Infused with Coconut and Grape Seed Oils, the lightweight lotion softens and conditions normal to dry skin, whilst Milk, Honey and Vitamin E leave the body protected and naturally nourished. Expect smooth, subtly scented skin with no greasy or sticky residue. Apply liberally as needed daily. Water, Decyl Cocoate, Glycerin, Helianthus Annuus (Sunflower) Seed Oil, Beeswax, Fragrance (Natural Fragrance), Butyrospermum Parkii (Shea) Butter, Cetyl Alcohol, Glyceryl Stearate Citrate, Polyglyceryl-3 Stearate, Cocos Nucifera (Coconut) Oil, Olea Europaea (Olive) Fruit Oil, Vitis Vinifera (Grape) Seed Oil, Nonfat Dry Milk, Honey, Aloe Barbadensis Leaf Juice, Rosmarinus Officinalis (Rosemary) Leaf Extract, Tocopherol, Beta-Carotene, Xanthan Gum, Sucrose Stearate, Glycine Soja (Soybean) Oil, Canola Oil, Lactic Acid, Citric Acid, Sodium Stearoyl Lactylate, Sodium Benzoate, Potassium Sorbate, Magnesium Aluminum Silicate, Phenoxyethanol, Benzyl Alcohol, Benzyl Benzoate, Benzyl Cinnamate, Citral, Coumarin, Limonene. I used to use this lotion regularly then moved on to other products, so thought I would try again as I remembered how lovely it was. The texture and moisturising are both still good but it smells really horrible - very plasticy. Now I've done further research I can see other people saying the same thing since it was reformulated. 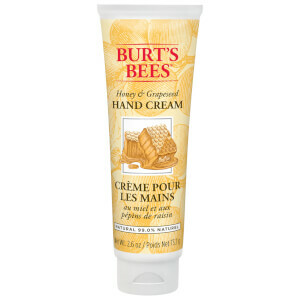 I can't use this cream because the plastic smell is so strong and unpleasant, very disappointing.